Tenacious and the center of attention, the Morkie is a toy sized breed of dog that is fun loving and full of life. They are sure to bring entertainment to any room they enter and fill their owner’s life with puppy dog charm. A charming and affectionate breed, this hypoallergenic breed gets credit for being excellent for allergy sufferers due to their small size, which means fewer allergens. The breed is often described as a big dog in a small body and really is the center of attention for everyone who meets them. They love being out with their owners and really thrive when they can be in the thick of the excitement. Despite being a small dog, they have an excellent energy level that makes them perfect for anyone who is looking for an active companion who also loves to spend hours cuddling up together. The Yorktese is a breed of companion dog that is quickly gaining popularity since it was first developed over twenty years ago. While it was one of the first designer dog breeds, it is unclear when and where it was first developed. The breed was developed by crossing the Yorkshire Terrier with the Maltese and efforts have gone into creating a breed standard for the Yorkshire Terrier Maltese mix. Breeders are establishing F2 breedings as well as acceptance by several breed registries including the Continental Kennel Club, the American Pet Registry and the American Kennel Association. The breed is also known as a Morkie, Yorkie Maltese mix, Yorkshire Terrier and the Maltese Hybrid. The Morkie is a small, toy sized breed that should be compact and delicate. They should have a slightly square body, although some are slightly longer than they are tall. The top line should be level and the overall look of the dog should be well balanced. The tail is often docked to medium length; however, many breeders opt to keep the tail long and natural. The head should be slightly round with a short muzzle. It is very important for the round eyes to be dark brown and the nose to be a dark black. The ears can be cocked or pricked and are usually small to medium in size. As mentioned, the Yorktese is a toy sized breed of dog that should have a very small stature. The Yortese should be about 8 to 10 inches in height and only 4 to 12 pounds in weight. There is no size difference between male or females and it is hard to tell the difference between the sexes of Yorktese. The coat of the Yorkshire Terrier Maltese can vary depending on which parent the puppy takes after; however, most Yorkshire Terrier Malteses have a long, silky coat. While they are puppies, the coat is short and silky; however, as they grow up, they will lose their puppy coat for a longer, silkier coat. The coat is usually so long that the hair will grow to cover the eyes of the Yorkshire Terrier Maltese and will often grow down to the feet of the dog. With colors, they can be found in a large variety of coat colors and markings. Typically, the breed can be black, tan, white or brown or a combination of the colors. Grooming the Yorktese is definitely not for faint of heart as the breed is notorious for getting mats in their coat. Because of that, there are two options that Yortese owners can choose: one is to keep the coat long and the other is to trim the coat into a puppy cut, which is close to the skin. If you choose the first option then owners should be prepared to brush the dog daily to prevent matting. In addition, the hair around the feet and on the face should be trimmed to keep it tidy. Yorktese require regular bathing and it is very important to brush the coat before the bath or it may mat. In addition, use a high quality dog shampoo and conditioner to keep the coat silky and dry the coat using a blow dryer until it is completely dry. Bathing should be done several times a month to keep up on the coat. Teeth should be brushed weekly but it important to check the teeth several times a week as the breed can be prone to tooth decay. Ears should be checked as well to prevent ear infections and nails should be trimmed once or twice a month. Feisty, brave and intelligent, the Yorkshire Terrier Maltese is a companion dog with a huge personality, despite their small stature. In fact, the common phrase, “big dog in a small body” is true to form with this breed and owners should expect just that when they own one. Despite their big personality, the Yorktese is a loving breed that is a perfect companion. They tend to be very playful and can be almost clown like with their antics. They love attention and fit into any social schedule that owners can give them. They don’t like being alone, however, and will let owners know when they are unhappy about being left alone. The Yorktese is a breed with a very long life span. If properly cared for and fed a high quality food, the Yorktese can live between 15 to 18 years. As a small breed, the Yorktese does not have large litters. On average, litter sizes tend to be 2 to 5 puppies, however, litters of just one puppy is not uncommon. Because of their small size, the Yorkshire Terrier Maltese can do well in any setting from a large home to a small apartment. It is important to note that the breed is known for being yappy so be aware of noise restrictions in your building if you live in an apartment. Because of their barking, they may not be suitable for some apartments. They should not be left alone outside as their size makes them prey for many predators. 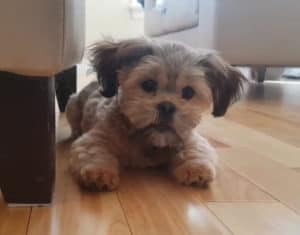 Morkies are an intelligent breed, however, they are known for having a mind of their own, which can make training difficult. But training is a must with this breed as they often develop Small Dog Syndrome, especially if owners treat them like a child instead of a dog. For that reason, the Morkie requires firm and consistent rules right from day one. They also need an owner that is in charge in the house or the Yorkshire Terrier Maltese will quickly take over the home. The breed needs consistent training and does well when they have about 15 minutes a day with training. It should be kept fun and owners should avoid repetition to prevent the dog from becoming bored. To prevent your Yorkshire Terrier Maltese from becoming too yappy, bark inhibition training is a good option for owners to teach their dog. In addition to training, socialization should be a daily activity. Generally, they get along with everyone; however, the breed does have terrier in them and they can be dog or pet aggressive. Despite their small stature, the Yorktese has a pretty good energy level. On average, the Yorktese should have a 15 to 30 minute walk every day to help them burn their energy. While they aren’t jogging partners, they do have a quick step that allows them to keep up to an average walking speed. In addition to daily walks, the Yorktese should have an additional exercise period of 30 to 45 minutes per day off leash. Because of their small size, this can be done inside with a short game of fetch down a hallway. Finally, provide your Yorktese with plenty of puzzle solving toys. As mentioned, this is an intelligent breed and keeping them entertained will help prevent behavior problems. The Yorkshire Terrier Maltese mix is a small breed of dog that should be fed a high quality dog food that is balanced for small breeds. In general, the breed usually eats between a half cup to a cup of kibble every day. They should have their meals split between two or three feedings and the breed should never have constant access to dry food. The reason for this is because it is hard to monitor the amount of food your Yorktese is eating when he has constant access to it. The breed is prone to obesity so food intake should be monitored and all treats, whether it is fresh meat, vegetables, fruit or dog treats, should be counted into his daily calories to prevent weight gain. Water should be offered throughout the day. Sweet, delicate and a happy bundle of cuteness, the Yorktese puppy will be tiny when you bring the bright-eyed love home. The breed is known for having tiny puppies that are full of zip and they are amazing at getting into trouble so puppy proofing your home is a must. In addition, extra care should be taken with the puppy. They can easily fall from tall heights or get into tight spaces where they can get hurt. Never leave your Yorktese puppy on a couch or bed without your supervision to prevent serious injury. When you bring home your Yorktese puppy, it can become very easy to baby them, especially since the breed is attention seeking; however, it is important to give them consistent rules and to start training right away. By doing so, you can help reduce the risk of creating behavior problems due to small dog syndrome. The Yorkshire Terrier Maltese mix is a versatile dog that can do well in a range of homes. They are an excellent breed for new owners, however, it is very important for all owners to set rules to prevent small dog syndrome. The breed usually does well with children, although they are not usually as patient as other breeds. Because of their small size, they are not recommended for homes with young children, as they can be hurt very easily. Also, because of their yappy nature, the breed is not suitable for apartments with noise restrictions as it can be very difficult to teach the Morkie not to bark. Finally, the breed can have a strong prey drive so they may not be suitable for homes with small, non-canine pets.